Starlings are called, literally, "teenager birds" because of their unruly habits and the fact that they congregate in large noisy groups. This is perhaps the most famous folk song in all of Valdyas - so famous, in fact, that the whole genre has been called after it. You can hear it here, sung by me with a strong Ryshas accent. Hanleni halsin tend to have a rather plaintive melody, in a minor key. It has four lines, generally rhyming aaaa, each with four feet; a foot consists of two or three syllables, at least one long and one short, at most two long and one short. All combinations of two or three long or short syllables within those limits are permitted. A syllable is long when it contains a diphthong or a long vowel (only in southern dialects; long vowels have been shortened or diphthongized everywhere except in the south) or a vowel followed by two or more consonants in the same word. The last syllable is usually unstressed. This is a result of the SOV-ness of Ilaini which makes the last word of a sentence a verb with an unstressed ending more often than not. This rhyme scheme might be very boring if it were not for the penultimate (stressed) syllables being different and livening it up. Ever play "telephone" when you were a kid? Think of it as Conlang Telephone. Here is a guided tour of the results, starting with a glossed version of the original. 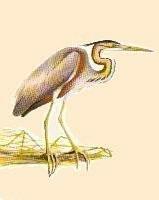 Vegelin III, King Vegelin the Great's grandson, who was crowned at the age of fourteen in 397, was called idanla lest "the blue heron" because he was tall and very thin, with long legs, and had the habit of wearing a blue-grey cloak. 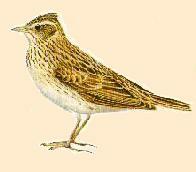 The lark traditionally doesn't sleep, but flies above the clouds at night. 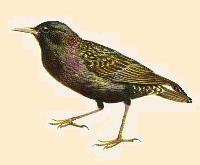 Its name means "high-bird". Pictures, slightly edited, from The Hamlyn Guide to birds of Britain and Europe.